L shaped front lounge with centre kitchen, full width bathroom with separate shower and fixed transverse rear bed. Swivelling front seats. There is a front drop down double bed. The centre lounge/dinette table also drops down to provide additional double bed if required. Engine heat exchanger including engine pre-heater (uses engine coolant water to heat entire living area) In winter the Alde central heating can be used to keep engine warm and assist with cold starts. 19 inch flat screen Avtex 193D High Definition TV (12 volt) with built in DVD player. Remote monitor added for monitoring solar charge rate. Snooper 7000 7 inch Sat Nav with European coverage, vehicle height and weight warning. TyrePal 6 wheel tyre pressure monitor unit with alerts for high/low pressure or temperatures. Curtain rail and curtains added to habitation area to close off drop down bed for easier night time use and privacy. Added a 2000kg electric winch with remote control to assist in loading and unloading transportation. This also includes a 285kg SWL aluminium ramp. The central locking system and vehicle alarm is operated by remote control. The remote has buttons to unlock either side lockers, extend steps or switch on exterior light. Central panel interior turns off or on internal motion sensors and locks external doors and sets alarm. With alarm on there is a red warning LED on the front dashboard. The alarm system monitors all external locker doors, habitation door and motion sensors monitor the inside of the whole area. My aircraft engineering background comes to mind here as we always viewed aircraft systems with both backup and fail safe systems in place. The Flair follows that same philosophy. We wanted to explore more remote areas we decided that we would make maximum use of solar power and also beef up the battery banks fitted as follows. Use: Exclusively for engine starting and chassis related electrics. Use: Habitation lighting, water pump, fridge and heating pump and all 12 volt systems and linking to an Inverter for all 240 volt appliances. Mains Electric is supplied by 2500W Sterling Inverter to supply 230v for Kitchen appliances, microwave, Omnistor 8000 awning and sockets in bathroom, lounge and external sockets. Electric Hook Up is rarely required as 434W of solar panels caters for all requirements for at least 10 months of the year. There may be occasions during Dec/Jan with prolonged spells of bad weather when the camper is parked for over 10 days in say a wild camping spot when there may be a need to use either generator or EHU. In our case we simply cut back on 240 volt usage and use gas to boil a kettle or use the grill to make toast. We have not resorted to EHU in over 6 years and neither have we used our generator. In fact we no longer carry our generator. Alde wet central heating radiators feed the habitation area. This is controlled by the TP5000 controller that allows automatic control of temperature and timing for up to 6 times per day. In addition there is a heat exchanger fitted that uses engine cooling water to heat the central heating system during transit. This maintains the heat in the habitation area during journeys and saves LPG. This feature can be turned off during summer periods. There is also a feature that allows the rear bedroom area heating to be turned on or off for those that don’t like heated beds. In severe weather the Alde heating system can also be used to heat up the engine cooling water to assist in cold starting and so reduce strain on engine battery and starter and improve fuel consumption. This also assists in defrosting the windscreen if necessary. The Alde system has radiators in the rear garage to prevent freezing and keep warm items in the garage. There are radiators in the double floor to ensure that the water tanks and waste tanks and pipe work are frost free during winter. 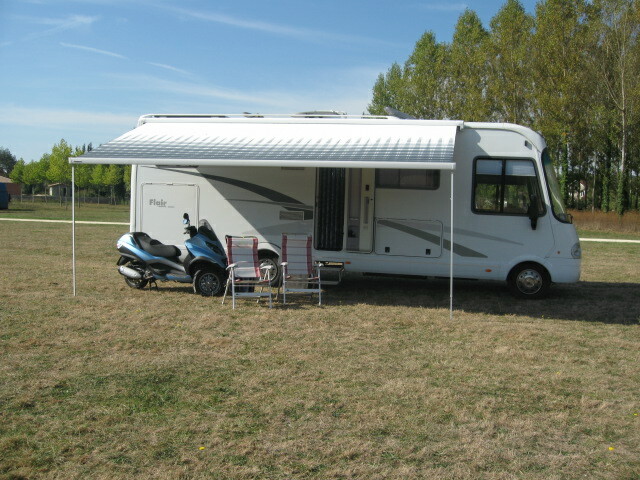 Fully loaded, including driver, full fuel and fresh water tank, extra batteries, awning, solar etc. and personal items the Flair weighs approx 5525kgs giving a further 475kgs additional payload if required.